While this pound cake is heavy on ingredients, the final result is so light and delicious on flavor. The lid on the cake has a delightful crunch, while the inside is soft and pillowy. I do wish that it had more strawberry flavor. You could easily accomplish that by using fresh strawberry preserves or jam instead of the glaze which I found to have very little flavor. It did make for beautiful swirls and I’m not sure if jam would come out the same. But I’d sacrifice looks for better strawberry flavor any day. This is a very easy pound cake to put together but a word of warning – it takes FOREVER to bake. The original recipe said 1 hour to 1 hour 10 minutes, but this took upwards of 1 hour 45 minutes in my oven. Even then the cake tester did not come out perfectly clean, but I took the cake out anyway because I didn’t want it to be too dry. When I served the cake, it was not undercooked in the center and the texture was perfect. Every oven is different but I highly doubt this will cook for you in just one hour. That said, still check it at one hour to see how it’s progressing. If the cake is taking a very long time to cook for you and you’re worried about the top of the cake becoming too dark or burning, cover the top with foil and continue baking. 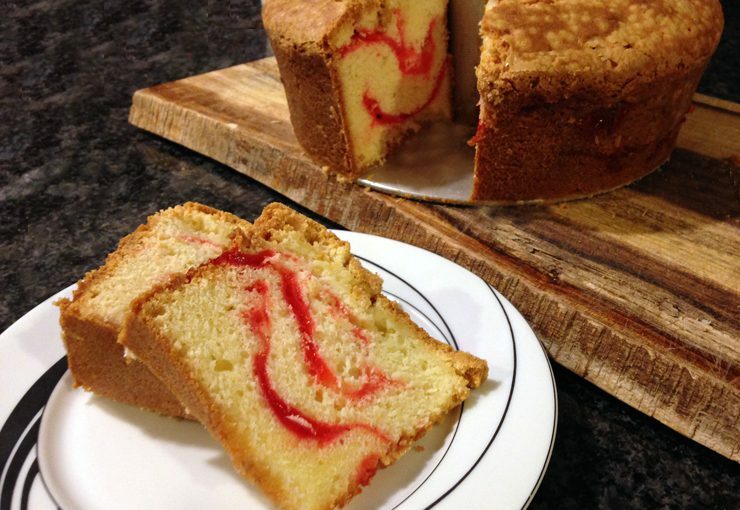 After making this pound cake, I read the reviews on the original recipe and found that many other people had the same experience with the cook time. I wish I read them ahead of time so that I wouldn’t panic when I had to cook the cake for so much longer than the original recipe said! But you luck out because now you know it may take a lot longer in your oven. The cake is worth it, I promise. Preheat oven to 350° Fahrenheit. Grease and flour a 10” tube pan and set aside. In the bowl of an electric mixer, beat the butter at medium speed until creamy. Slowly add in the sugar, continuing to beat at medium speed until light and fluffy. Add in the cream cheese and beat until creamy. Add the eggs one at a time, mixing until just combined after each egg. Whisk the flour, baking powder, and salt together in a bowl. Turn the mixer down to low then gradually add the flour mixture. Scrape the bowl and mix until fully combined. Pour in the vanilla extract and blend. Pour 1/3 of the batter into the tube pan then dollop 8 rounded teaspoonfuls of the strawberry glaze on top. Using a wooden skewer, swirl the batter with the strawberry glaze. Pour another 1/3 of the batter on top, followed by 8 rounded teaspoons of the glaze and swirl again with the skewer. Top with the remaining batter. Bake anywhere from 1 hour to 1 hour 45 minutes…the original recipe said 1 hour to 1 hour 10 m minutes but this took 1 hour 45 minutes in my oven. The cake is done when a wooden pick inserted in the center of the cake comes out clean. Cool in the tube pan on a wire rack for 10-15 minutes then remove the cake from the pan and let cool completely on a wire rack before serving.